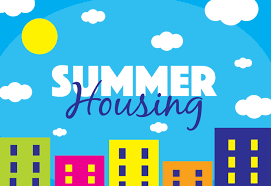 Spend your Summer in Sunny South Orange – Summer Housing Applications Now Available! 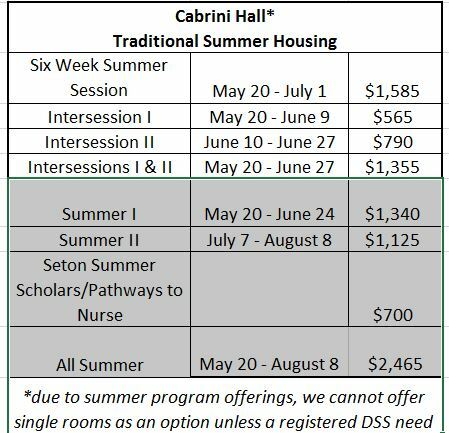 If you’re taking summer classes or have a University-affiliated job or internship, you’re welcome to sign up for Summer Housing. Summer Housing will be assigned in South Boland Hall this year. Students who wish to apply for summer housing may do so through the Summer Housing Application under the applications tab on their Housing Profile on PirateNet. There is no housing deposit required. Summer room assignments are made “hotel style” meaning that room assignments will be made at the time of check in. Students wishing to be roommates should plan to check in together. Author Cheryl McCloskeyPosted on April 5, 2017 April 4, 2017 Categories Assignments, Housing Application, Out of state, Processes, Residence Halls, Summer Housing, UncategorizedLeave a comment on Spend your Summer in Sunny South Orange – Summer Housing Applications Now Available! Even on rainy days like today, summers spent on-campus at Seton Hall just feel sunnier! Today between 3pm-5pm, summer students who applied for summer housing will move into Aquinas Hall. Check-in will be conducted “hotel-style” with rooms being assigned on the spot. Students who wish to live together should plan to check-in at the same time to assure they will be placed together. 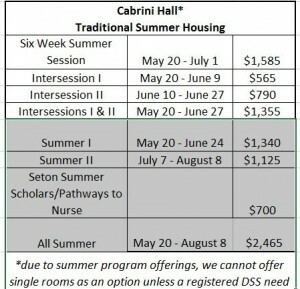 It’s not too late to apply for housing for later summer sessions!